So by now you may have seen Bear Camp arrive in your favorite local and online quilt shops. 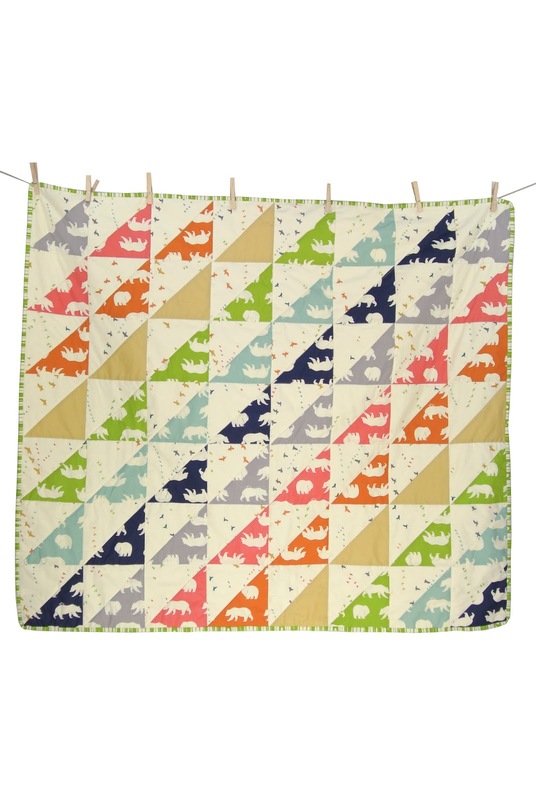 We whipped up this cute and beginner friendly quilt showcasing the lovely colors of Bear Camp! We used the Flight Multi from the Just For Fun collection as the sashing and we love the way it cuts up so you can just see bits and parts of the birds in flight. This quilt is perfect for beginning sewers, in fact it’s a great pattern to learn a couple tricks too! To celebrate the release of this pattern we’re giving away a half yard bundle of all Bear Camp Poplins! Read on for more details! Click here to download the free PDF pattern directions. Way cute fabric! Would love these to make a quilt for my moms cabin. Cute Fabric! Thank you for the pattern!! I'd make a quilt for my bestie who is expecting. I would use the wood prints in a quilt & the robot/transports in pillow shams. Both with coordinating solids to tie the projects together. I love polar bears and would make a family lap quilt to read under. 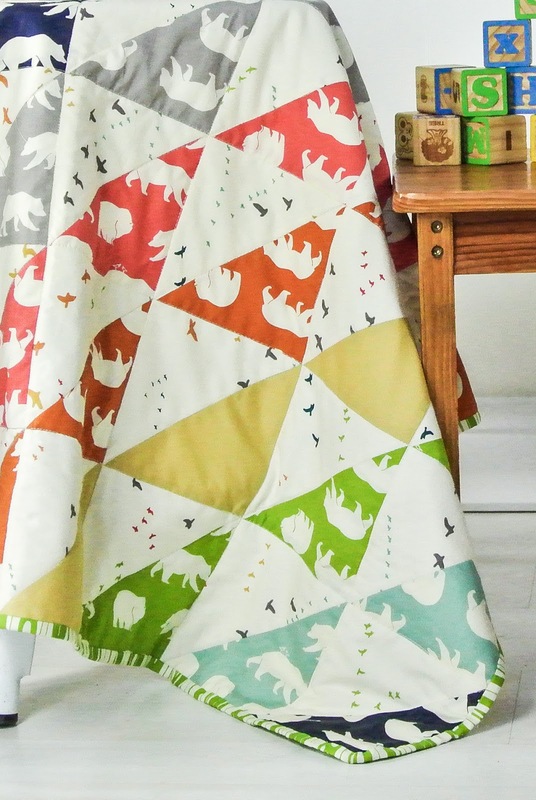 I like bears and I like to sew with wildife fabrics. Deer and Moose are other favorites. Thanks a bunch for a nice giveaway. I would make a quillow if I won. Lovely fabric thank you! I'd make a quilt! So pretty! I love this new line! It would be so much fun to win! I know just who I can use the bear fabric for. I would make a quilt for my soon to be new baby. I would make a new picnic quilt for my family! Looooooooove these fabulous poplins! I am crossing my fingers and toes and everything else! Thanks for sharing! I'd make a quilt for my niece and nephews. Very cute!! I love this fabric and quilt! The colors and print are just too gorgeous! I can see some chair pillows for our outdoor deck! I would make a lap quilt. It's a gorgeous print; thanks for the giveaway! I would love to make a quilt with it. The bears on that quilt above are just so cute. Love all the colors too. A quilt of course! The fabric and pattern are lovely. I would make some pillows or blankets with this! I'd probably make some pillows or maybe a quilt. Great fabric. I would make a quilt for my brother in NY who calls his place Bear Camp lol thanks! These fabrics would make a great little quilt for my grandson-with pillowcases to match! LOOOOOOVE this fabric Bundle!!! Thank you for chance to win!!! I will use to make a fun Throw for our Family Room! would love a quilt featuring these bears! This fabric would definitely be made into something for my husband's home office that is decorated with bears. He has been known to take a snooze in there on the couch, so maybe this would be made into a quilt. Birch Fabrics' new lines are the first choice with modern sewists! I love the whimsical and contemporary prints. I just saw the pattern for log poufs…would love to make bear poufs for my three kiddos. The bears don't want to be part of quilt, they want to become clothes! This fabric would be perfect in my boy's room! We are painting this week too! I'd use the fabric to make some accent pillows!